“The ultimate measure of a man is not where he stands in moments of comfort and convenience, but where he stands at times of challenge and controversy.” – Rev. 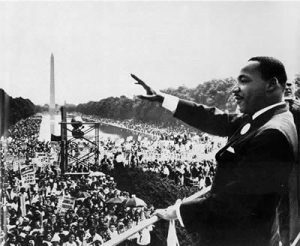 Dr. Martin Luther King, Jr.
What should I do, as a white man, prison minister who was incarcerated for a white-collar crime, and as Executive Director of a Connecticut criminal justice nonprofit, to walk in the footsteps of Martin Luther King Jr.? How do I apply his words, that are so easy to read but so difficult to put into action? How do I honor his memory in these most challenging and controversial of times? The moment of our comfort and convenience is certainly over. This is true on the national level where we have new, untested leadership. And this is also true here in Connecticut, where the budget crisis has made the state unable to do what is just, and fair, and safe. Our state government has closed prisons and reduced the prison population to the lowest level since the 1970’s. This is a good thing. However, we are in a paradigm shift of epic proportions in which there is no public money to fund solutions to our current problems – and no adequate explanation as to how we got into this situation. And yet, we keep going back to the state looking for handouts – for funding the way it has always been. And we are surprised and hurt when the answer is no. I urge everyone, and especially my fellow criminal justice colleagues, to wake up. The fiscal crisis has caused the state to terminate the funding for – and close down – our community-based prisoner reentry behavioral health programs. This means thousands of people, many or most of them people of color, will be released from jails and prisons this year without access to therapy, life skills training, mental health services, substance abuse counseling, housing opportunities, education, or even minimum wage jobs. I propose that without this critical support, most are going to recidivate and will go back to prison in record numbers. But not before they return to the very behavior for which they were incarcerated in the first place. This is a very bad thing – for everyone. How big is this problem? Michelle Alexander, in discussing her seminal book “The New Jim Crow” cites that there are more African American men in prison and jail, or on probation and parole, than were slaves before the start of the Civil War. The theologian Audre Lorde observed that, “the master’s tools will never dismantle the master’s house.” If this is so, we need to find new tools. We need to stop groveling. With fewer government dollars to support our missions, we can get creative. We can seek out and find solutions even if the state has limited ability help us. We can envision a real private/public partnership, with compassionate foundations and other institutional sources willing to fund our justice reform efforts. These funding sources will provide support for our advocacy in promoting change and will reward our evidence-based impact in reducing recidivism – and hold our feet to the fire if we do less. So, where do I stand at this moment of challenge and controversy? I will do as Dr. King did – do my best. Do anything and everything it takes. And like Dr. King, take comfort in knowing that – if we really work together for it – we, as a people, will get to the Promised Land. Robert Bridges Jeff Grant, JD, M Div In your latest offering you note that “the master’s tools will never dismantle the master’s house.” If this is so, we need to find new tools. We need to stop groveling. With fewer government dollars to support our missions, we can get creative.<<” I agree 100% We get creative and we speak out from our hearts and we stay flexible and innovative and focused just as you are with your work reforming the criminal justice systems. RONALD R. KARNS III I’m curious if Dr. King would want us to walk in his footsteps? I think he would want us to blaze our own trail of social justice. Connie Shelley When I first met VIncent Harding (a co-conspirator and good friend and jail mate of Dr. King) in 1964 he told me that MLK knew he would die, he just didn’t know where or when. Since that time I have often asked myself how far I’m willing to go for the sake of Justice. I work in a prison, but I don’t live there; I speak with those who have no homes, but I don’t live there, either; I drive through the places where the most minorities live in Denver, but I drive back to my house. In other words, I can always leave and go home where I’m comfortable and feel safe. That’s one thing that Dr. King didn’t always do…so perhaps there is an invitation for me in that in some way. Jacques Johan Swanepoel Sorry but I rather walk in the footsteps of Christ rather than any men or woman on this earth. Bob Russel (CIPA 08) Hi There; In my personal opinion by doing personal posting like this will certainly honour the life of MLK. Thank you. Robert Bridges. Yes, perhaps the invitation is to explore the places inside where you feel uncomfortable ….. and maybe too those places inside where you feel secure and comfy and to push against that? Connie Shelley Robert, I have just started reading, “The New Jim Crow” and I am already confronted with my own crap. The book is required reading for a Learning Tour that I’m doing in March. We will be going to New Orleans and visiting people, jails and Angola prison. One thing I learned in the book is that the “war on drugs” was started by Reagan before there was a drug problem and, in fact, drug use was on the decline.. The CIA was involved in propping up the guerrillas in Nicaragua and the guerrillas were bringing drugs into this country and law enforcement was told to let it flow into the poor neighborhoods of color. We went from 350,000 incarcerated people in the early 1970’s to over 2 million today. If you haven’t seen the movie, “13th”, I would recommend it. Racism is alive and well but it has been recast to look like something different. Connie Shelley And, since the incarceration rate for people of color is much higher than for a nice white middle class males a whole population is kept from voting, housing, jobs and any kind of social benefits. As R. Rohr points out, everything is connected in the Great Chain of Being and if I fail to see the Imago Dei in anything, I have broken the chain. It is the denial of our connectedness that allows us to feel and act superior and allows the private prisons to be a burgeoning industry in our country. Hmmm…..looking for Imago Dei in our new White House and cabinet…don’t wanna break the chain. Robert Bridges Yes, I’ve been reading the same book. Its very disturbing and to me one of the most disturbing aspects is that our almost exclusively white male supreme court’s have gone out of their way to make justice for a black man an oxymoron. Connie Shelley Robert Bridges have you read, “Just Mercy” by Bryan Stevenson? His work is amazing. Darrell Allen I have experienced seasons of homelessness along with seasons of jail time. In fact, on July 16, 2004 I was supposed to have received 25 years without no chance of parole; but God’s unconditional love, grace, and mercy showed up in the power of the Holy Spirit and I only ended up doing 6 months. I think the real question should be: “What Should We Do to Walk like or imitate Jesus?” I say this because Martin Luther King Jr showed us the unconditional love, grace, and mercy of Jesus in his every day walk of life. He was even willing to die for his belief in doing God’s perfect will and becoming a ultimate sacrifice for Jesus’ ministry of love for one another (John 13:3-35; 15:13).